If plan to welcome a four-legged friend into your home, you are likely feeling a range of emotions. You can't wait to be a pet parent and share your life with a lovable puppy who will become your best friend, but you aren't sure how to ensure his comfort and safety in his new home. To help ease your anxiety and ensure you enjoy your new pet as much as possible, follow our tips. Preparing for your puppy will take some time, so give yourself enough to purchase supplies and get your home ready before his arrival day. First, purchase a crate and a bed for your puppy. These will be his safe spaces within your home, and he will visit them when he feels overwhelmed or tired. Crates do more than provide a safe space, however; they also aid you in housetraining and preventing misbehavior. Purchase a crate that is the appropriate size for your dog. Most vets and trainers agree it should be just large enough for your dog to stand up and turn around. 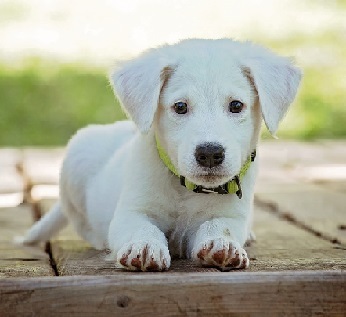 Other must-have puppy supplies include food and water bowls, toys, high-quality dog food and treats, a collar and leash, and grooming supplies. Know the requirements in your area for obtaining a dog license. Also, purchase an identification tag for his collar so people can contact you if he gets lost. Include your name and phone number. Then, consider getting him microchipped. The tiny device contains your contact information and will help you reunite with your dog and prove your ownership of him. Another way to prepare for your puppy's arrival is to determine how to keep him safe in your yard. If you don't have a fenced-in yard or live in an area that does not allow visible fences, get a puppy pen to keep your new addition contained and safe while playing outside. Keep in mind that you won't need the puppy pen forever, but it is an important purchase for keeping your puppy safe when you first bring him home. Eventually, you will need to put in a tether and run to keep your dog in your yard. Better yet, you can start boundary training your puppy to stay in your yard without installing a tether and run or an expensive underground electric fence. Purchase marker flags from a local hardware store, a clicker, and some nutritional treats for your puppy. Check with your veterinarian about which treats are best for your new little guy; she may recommend carrots or very small pieces of grilled chicken. Begin by training your puppy indoors. Show him the flag and use the clicker and give him a treat when he touches it with his nose. Continue by moving the flag further away and practicing for about a week before you move the training outside. Begin with a small boundary outdoors; don't line your property with flags and allow your puppy to run loose while expecting him to stay within them. One aspect of puppy ownership that gets frustrating is housetraining. Remain patient and calm and guide your pup through the process using crate training, making frequent trips outside, and using paper training. Keep a consistent schedule with feeding, exercising, and making trips outside and have treats ready to reward him when he relieves himself in the proper places. At the very least, you should take your very young puppy outside first thing in the morning, after playing, after spending time in a crate, after waking from a nap, after chewing a toy or bone, after eating and drinking, and at bedtime. You also need to know how to remove pet odor from your carpets so your pet does not smell his urine and continue to relieve himself in the same spot. Purchase an enzyme-based pet odor remover from a local pet supply store and soak the area before covering it with cardboard or other material. Do not dry it quickly because the product needs to have time to work to remove the urine odor. Becoming a first-time pet owner is an exciting and scary time. But, you will succeed at making your pet safe and comfortable if you purchase supplies ahead of time, plan for outside time, and make training a priority.